Worldwide, Iridaceae, the Iris Family comprises 65 genera and approximately 6700-7170 species. The growth forms of this family range from herbs to shrubs with all of our species being herbaceous. The Iris Family or Iridaceae was named by A.L. de Jussieu in 1789. This family was first recognized by John Ray in 1703 as a separate group of flowering plants. The basis for Iridaceae is the genus Iris. Linnaeus is credited with naming this genus is 1753. The name “Iris” is derived from the Greek word for rainbow and is also the name of the Greek goddess of the rainbow. The color variation of iris flowers is like the colors of the rainbow. References to members of the Iris family go back to antiquity with the Greeks such as Aristotle and Theophrastus and in Roman times with Greek physician Dioscorides in his first century De Materia Medica and the Roman author Pliny the Elder. Iris pseudocorus, yellow iris or flag, was used as an emetic and purgative, and as a source of tannins to dye or tan leather, as well as to make a black ink. The ancient Egyptians revered the iris and used orris root in ceremonies, perfumes, and as symbols of life, victory and power. European herbalists such as Rembert Dodoens, John Gerald, and Nicholas Culpeper of the 16th century wrote about the medicinal uses of species of irises. John Clayton in the Flora Virginica (second edition 1762) listed species in the two Iris family genera, Iris and Sisyrinchium. Clayton listed Iris verna, dwarf crested iris; Iris virginica, Virginia blue flag; and Sisyrinchium bermudiana, the Bermuda blue-eyed. Herbarium specimens of these species are in the John Clayton Herbarium at the British Museum of Natural History. In the Flora of Virginia, the treatment of Iridaceae includes two genera, Iris and Sisyrinchium, and 15 species with two varieties. Worldwide the Iris has 282 species that are primarily native to the Northern Hemisphere. In the Flora, there are eight and two varieties treated in the Iris. All of these Iris species except for Iris pseudocorus, yellow iris or yellow flag, and Iris domestica, blackberry or Leopold lily, are native and are found in our northern part of Virginia. Linnaeus assigned binomials to all of these Iris species except Iris cristata, dwarf crested iris, and Iris domestica, blackberry or leopold lily. Iris cristata was described and named by William Aiton in 1789 and also was renamed briefly Neubeckia cristata by R. Alefani in 1863. In that same year Alefani also proposed renaming Iris Verna as Neubeckia verna. In the Flora, there are a limited number of taxonomic changes in this family’s treatment in the floras from the late 19th– early 20th century. Based on DNA research, the primary taxonomic change is for Belamcanda chinensis, the blackberry lily, renamed Iris domestica in 2005 by P. Goldblatt and D. Mabberley. This Asian species has a varied taxonomic history. Linnaeus first assigned the binomium of Epidendrum (an orchid genus) domesticum in 1753 based on an illustration by Engelbert Kaempfer which, in turn, was based on a collected specimen that was a combination of an orchid and a member of the Iris family. In 1914 W. Druce renamed Linnaeus’ species Vanilla domestica (the genus Vanilla is also an orchid genus). To complicate this story, Linnaeus also assigned the binomium Ixia chinense to another specimen of the blackberry lily. Other common synonyms for this species are Belamcanda chinensis by A. de Candolle in 1807, Belamcanda puntata C. Moesch in 1794, Gemmingia chinensis (L.) C. Kountze in 1891, Morea chinensis C. Thunberg in late 1700’s, and Pardanthus chinensis J. Ker Gal. in 1805). taxonomic questions remaining in our area.” The Flora included seven species of Sisyrinchium with three species documented in our northern area of Virginia. All seven of these species are native species. 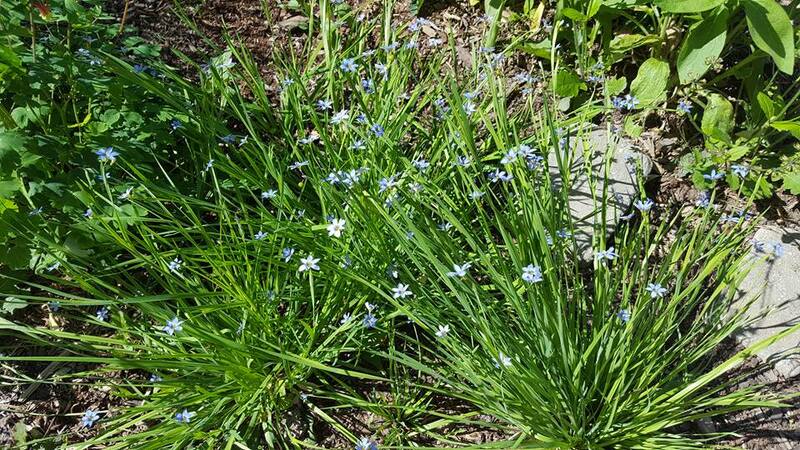 Sisyrinchium was named by Linnaeus in 1753 with the species Sisyrinchium bermudiana, the Bermuda blue-eyed grass. This genus name is based on the Latin sūs “pig” and “nose” Greek rhynchos based on pigs observed grubbing for the rhizomes of an European iris, Iris sisyrinchium. The name “Sisyrinchium” was used by Pliny and Theophrastus for this species of iris. Linnaeus’ choice of this genus name Sisyrinchium by for this New World genus apparently was arbitrary. Of the seven blue-eyed grass species treated in the Flora, only two species Sisyrinchium angustifolium, narrow-leaf blue-eyed grass, and Sisyrinchium mucronatum, needle-tipped blue-eyed grass, are common in our northern part of Virginia. Sisyrinchium fuscatum, coastal plain blue-eyed grass, has been documented in Fairfax County. Sisyrinchium angustifolium was named by P. Miller in 1768, Sisyrinchium mucronatum by A. Michaux in 1803, and Sisyrinchium fuscatum was named by E. Bicknell in 1899. It is interesting that Linnaeus used two examples of Sisyrinchium bermudiana, an alpha and a beta specimen, to assign the Sisyrinchium bermudiana binomium. Linnaeus used the alpha specimen as the basis to describe this species and he indicated it was “of Virginia,” but the beta species was a specimen was collected in Bermuda. The specimen he described as “of Virginia” was possibly Sisyrinchium angustifolium.